As digital cameras came to dominate photography, by 2006 the selection of 35mm film SLRs sold by Nikon dwindled away to just two models. The Nikon F6 was a superb, professional, autofocus SLR. The Nikon FM10 (like the autoexposure FE10) was a distinctly plasticky amateur model introduced in the mid 1990s, with manual focus and manual film transport. Yet this back-to-basics appeal for traditionalists or students of film photography has kept it on the market into 2015. 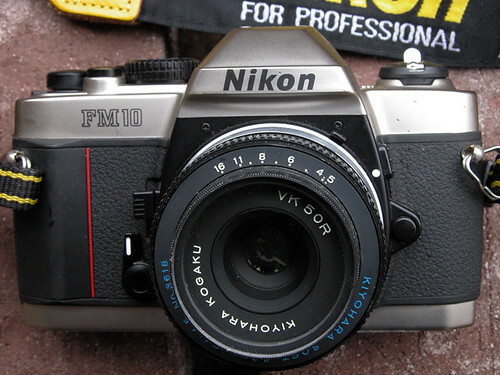 Unlike the F6, the FM10 is not manufactured by Nikon. It is actually made by Cosina (derived from that company's CT1 Super), and so is a sister to other Cosina-made "back to basics" SLRs such as the Vivitar V4000s or Ricoh KR-5 Super II. However the FM10 is the only one of these accepting Nikon F-mount lenses. The FM10 also adds a meter-activation button to the side of the lens mount, a multiple-exposure option, and a depth-of-field preview lever. Flash Synchronization: Standard ISO type hotshoe contact on the Accessory-shoe. ↑ "Nikon to stop making most film cameras" from NBC News (USA). This page was last edited on 6 July 2015, at 16:15.